Besides baking with them, WholeVine founders suggest using them to thicken cream sauces, to dust homemade marshmallows, for seasoning rubs and salts, and to emulsify salad dressings. 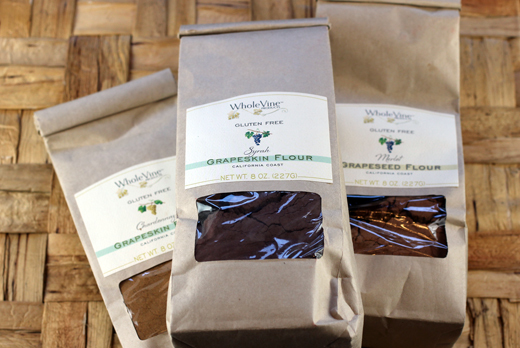 Grape skin and grape seed flours are all gluten-tree. 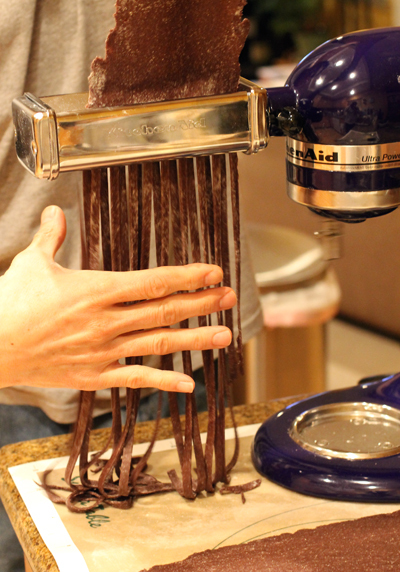 I had my heart set on making pasta when I saw the Syrah grapeskin flour, which is as dark as cocoa powder. 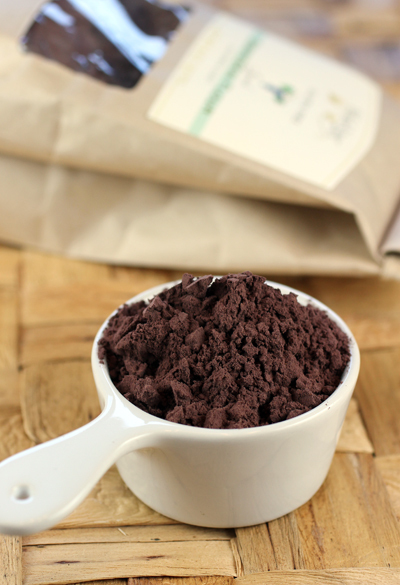 Not that I normally go in for eating raw flour, but I just had to taste this in its natural state. There’s a tang to it from the tannins, as well as a nutty, earthy flavor. The aroma of the flour is fruity, almost like that of a damp wine cellar. 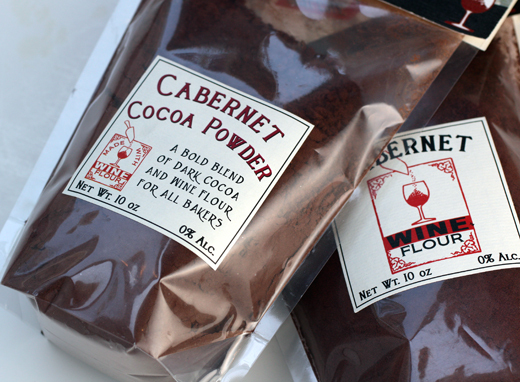 I adapted a pasta dough recipe from the WholeVine Web site by Chef Eric Frischkorn of Kendall-Jackson Wine Estates, which originally called for the Merlot grapeskin flour. It makes for rich, eggy noodles, as there are 2 whole eggs, plus 5 yolks in the dough. So much so that even though you end up with less than a pound of pasta, it’s more than enough to feed four people. Notice the color of the pasta dough. When I think of Syrah with its typical dark cherry, chocolate and pepper characteristics, it can’t help but make me think of duck. 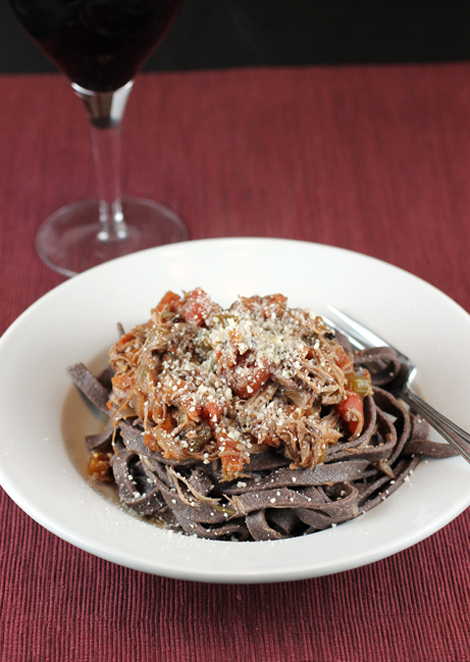 The “Venetian Duck Ragu” recipe is from the September 1, 2011 issue of Fine Cooking magazine. duck legs are braised with garlic, onion, celery, carrot, sage, bay leaf, canned tomatoes and a cup of wine. When cool enough to handle, you shred the duck meat and add it back to the pot to create a thick pasta sauce redolent of wine-y goodness. The sauce can be made the day before, too. 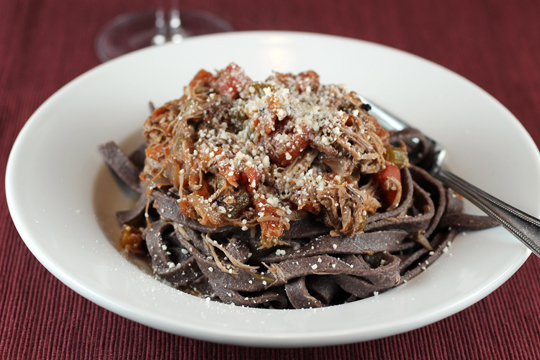 The pasta, which is not gluten-free because it does include some all-purpose flour, is the color of chocolate crossed with buckwheat, dark brown with a hint of purple to it. Dig a fork in to enjoy a celebration of Syrah. A close-up of the dish in all its glory. Heat oil in a 5- to 6-quart Dutch oven or other heavy-duty pot over medium-high heat. Season both sides of the duck legs and thighs with salt and pepper and arrange them in the pot, skin side down. Sear until the skin is browned and crisp, about 7 minutes. Using tongs, turn legs over and brown the other sides, 2 to 3 minutes. Transfer the duck to a deep platter. Pour off all but 1 tablespoon of the rendered fat and discard or save for another use. Reduce heat to medium low. Put celery, garlic, onion, carrot, sage and bay leaf in the pot. Cook, stirring frequently, until the vegetables are softened, 7 to 8 minutes. Pour in the wine and increase heat to high. Cook at a lively simmer for 1 minute and then reduce the heat to medium. Stir in the tomatoes with their juice and 1/2 cup of the broth. Return duck to the pot and bring the liquid to a boil. Reduce the heat to medium low or low to maintain a gentle simmer. Cover the pot and simmer until the meat is fork-tender, 1 1/2 to 2 hours. Remove the duck from the pot and set aside until cool enough to handle. Meanwhile, skim excess fat from the top of the sauce with a large spoon. If the sauce seems thin, continue simmering until flavorful and thickened to a saucy consistency. Remove duck skin. Discard or crisp up in a saute pan or under the broiler for a fun little snack. Shred the meat. Add shredded meat to the sauce, along with the other 1/2 cup of broth if the sauce seems too thick. Let sauce simmer gently for 15 minutes; discard garlic and bay leaf. Season to taste with salt and pepper. When ready to serve, bring a large pot of well-salted water to a boil over high heat. Cook pasta until al dente, about 3 minutes. Reserve about 1 cup of the cooking water, then drain the pasta. Return pasta to the pot and toss with some of the ragu, adding a little cooking water if it seems dry. Serve pasta with more ragu spooned over the top, garnished with freshly grated Parmiginao-Regginao, if you like. Make Ahead Tips: The ragu can be refrigerated in an airtight container for up to 3 days or frozen for up to 3 months. Reheat gently before tossing with pasta. In a bowl, whisk together eggs and oil. Set aside. In the bowl of an electric mixer fitted with the dough hook attachment, add the flours and salt. Make a well in the center of the flour and pour the egg mixture inside. Mix for 2 to 3 minutes on low speed, adding water to moisten if necessary. Place dough on a floured work surface and knead until a ball is formed. Wrap the dough in plastic wrap and let rest for at least 30 minutes in the refrigerator. Divide the dough into 4 equal portions. Roll dough through a pasta machine, starting at the #0 setting and working up to the #5 setting, dusting with all-purpose flour as needed. 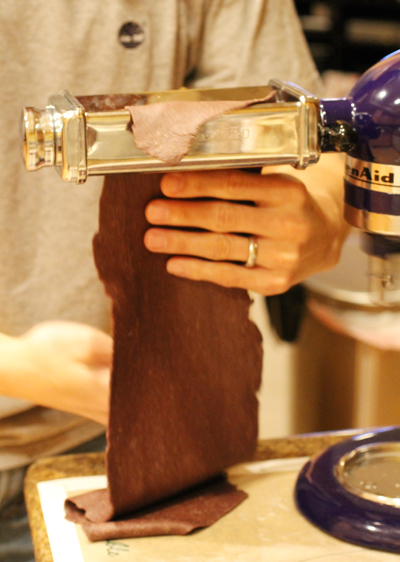 When the sheet of dough gets too long to handle, simply fold the dough in half and continue to roll through the machine. Dust the sheets of dough with semolina flour and cut into fettuccini. Cook, according to directions in ragu recipe.